Dies R Us: Hang In There! Can you believe it is the first of July already? I can't believe how quickly the summer is going! There never seem to be enough hours in the day, at least at my house! I'm sure it is the same at yours. So today's post will be a fun & quick way to send a little cheer to a friend. I began with a darling little digi from Tiddly Inks which colors up quickly. I cut her out with Memory Box Stitched Rectangle Layers using a layer of white & one of purple polka dot. For the beautiful lacy border, I used Spellbinders A2 Scalloped Borders Three and finished it all off with a bow from Memory Box Plush Bow. Although the stitched rectangle layers and scalloped border dies are currently out of stock, they should be back soon. Just add your name to the wait list & they will notify you the moment they are back in stock! Be sure you head over to the Dies R Us Store to check out all the fantastic dies. They carry the largest selection of dies around and the prices & shipping can't be matched! 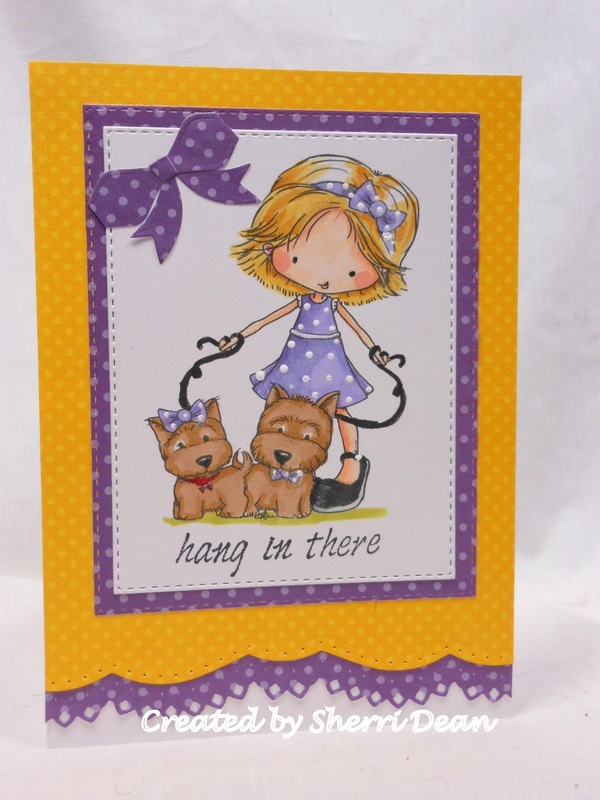 Don't forget the new challenge that just started today over on the Dies R Us Challenge Blog! It's a lot of fun and a great chance to win a gift certificate to the store! Until next week, have a wonderful week and make sure you create something wonderful!